Coach Brent gives you a 10 step guide to getting your football kicking & punting tuned up in only 10 days to start your football training camp strong! This week I received a ton of calls asking ‘What can my son due to get his kicking/punting tuned up for the start of the 2011 season?’ (which begins on August 1st and only 10 days away!) Well, most of you who have been training with me on a consistent basis are already tuned up and ready to go. 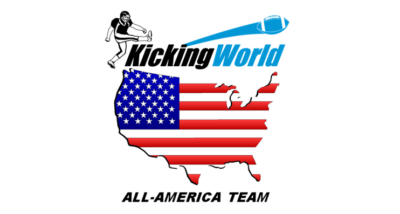 You’ve been following a program that has gradually increased your kicking frequency over the last few months and has improved your accuracy, distance and overall confidence. Well what about the kickers and punters out there who let the summer slip away and have only practiced a couple times, or even worse- not at all! Yes, you are definitely behind schedule and should have been practicing all summer, but don’t worry! I have created a special 10 step emergency tune-up guide for you to follow over the next 10 days which you will start TODAY! This is for every kicker/punter whether youth, HS, College or Pro. You should print this guide out or save it to your phone so you can committ to it over the next 10 days. Good Luck! (F 7/22, S 7/24, T 7/26, R 7/28, S 7/30 and S 7/31). This will allow you to kick 6 times over the next 10 days and help build your confidence back up and get your leg conditioned again for weekly kicking/punting. You need to fire up those fast twitch leg muscles and build SPEED. Speed trumps Strength in kicking/punting. I am not asking that you go run incredible long jogs. What I’m recommending is something geared toward firing up your fast twitch muscle fibers and consumes much less time but is more challenging. The following sprinting drill will help generate more speed and allow you to get that ‘fast leg snap’ as well condition your body for the gruelling double-sessions with conditioning drills your coach will put you through the first 2 weeks of practice in August. Sprint Goal Line to 10 Yard Line (touch hand to line) and sprint back through Goal Line. Rest 5 seconds. Repeat and without rest run back to the 20 (touch hand to line) and sprint through goal line. Rest 20 seconds. Repeat both 10 and 20 and continue without rest sprinting to 30 yard line (touch hand to line) and sprint through goal line. Rest 30 seconds. Repeat all 3 without rest and continue sprinting to 40 yard line (touch hand to line) and sprint back through Goal Line. COMPLETE. This will probably tire you out if you haven’t been doing any conditioning. Do this every other day through July 31. If this is too easy for you, I would like you to repeat the process in reverse (Run to 40 and back, Rest 5 seconds. Run to 40 and back then 30 and back. Rest 20 seconds. Run to 40 and back, 30 and back, 20 and back, rest 30 seconds. Run to 40 and back, 30 and back, 20 and back, 10 and back. COMPLETE! Your muscles need to be flexible and strong to endure daily double-session practices the first 2 weeks of football camp. Also, your legs need to be loose/flexible to ensure you can kick/punt fundamentally sound and decrease the risk of injury due to strained quads, hamstrings, groins, etc. The easiest solution to ensure you ‘get your stretching in’ is to follow the FREE downloadable 3 page Football Kicking ‘Stretching Guide’. Do this DAILY and do it 2-3 times per day. It should take you roughly 10 minutes each time you stretch. If you can committ to stretching when you shower in the morning, before & after you kick, and before you go to sleep you will feel much more ‘loose’ and you will significantly increase your chances of a healthy injury-free season. On top of that, your genuine well-being will improve and if you have constant back, hip or other pains, these stretches will help to alleviate some of that pain due to tension/pressure/stiffness. The word ‘core’ has become so widely used of late. I hear it used more often than anything in the workout world. Your ‘core’ refers to the center of your body consisting of mostly your Abdominal Muscles, Hips and Low Back. These 3 muscle groups are paramount in a kicker or punter. I encourage you to implement core excercises in the gym at your workout sessions now and through the season. I recommend a personal trainer who can help you with specific kicking or soccer type of core movements or simply calling me to schedule a 1 on 1 in-gym training session so I can show you around the gym and give you specific workouts based on your body type that will help improve your overall balance, stability and strength. If you don’t live in California and can’t come out to see me, here’s a few simply ones for you to do (do these 2-3x per week, usually at the end of your gym session). Schedule a 1 on 1 Training Session with me any Sunday at Laguna Hills High School in beautiful Orange County, CA or any other day in beautiful San Diego, CA with 3 locations near downtown, La Jolla and East County! I offer kicking lessons and punting lessons year-round in So Cal. You can also fly me out to train your son 1 on 1 wherever you may be located or come train with me for a 3 Day session like this Professional Kicker did (see his before & after instructional YouTube Video). Sunday, July 31 One-Day Camp Only! Tuesday & Wednesday, July 26-27! As always, feel free to e-mail or message me on Facebook or YouTube if you have any questions or need help with anything. Our YouTube site and Facebook page are incredible resources for you to get free tips, participate in contests and make some kicking/punting friends. You must ‘LIKE’ the Facebook page to unlock all the additional features. Have a great start to your 2011 Summer Camp!